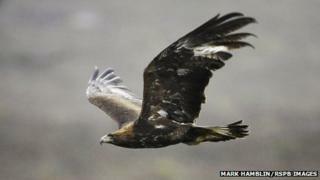 A series of measures have been drawn up aimed at protecting Scotland's "magnificent" wildlife. Launching the initiative, he condemned the "outdated, barbaric and criminal practices" which he said had put wildlife at risk. Mr Wheelhouse added: "I am determined to stop illegal persecution of raptors." Mr Wheelhouse said eradicating crimes against birds of prey "remains a high priority for me and for this government". "Outdated, barbaric and criminal practices put at risk some of our most magnificent wildlife and have horrified a wide range of people across Scotland and those who love Scotland," he said. "Wildlife crime, and raptor persecution in particular, often takes place in remote locations or in the dark of night. "Through these new measures, I am keen to maximise the opportunity for offences to be detected and offenders to be tracked down. I am determined to stop illegal persecution of raptors that continues to blight the Scottish countryside." Duncan Orr-Ewing, head of species and land management at RSPB Scotland, praised the Scottish government's "strong leadership" on the issue. "It is firmly established that the prevailing levels of human killing are having a devastating effect on the populations of some of our native bird of prey species," he said. "Recent incidents involving the killing of golden eagles and other iconic bird of prey species have rightly caused public outrage. We support further sanctions to act as a deterrent. "We hope these measures are well targeted to bear down on the organised crime behind much of this activity." But Scottish Land and Estates voiced fears that the government could be moving away from a criminal standard of proof in wildlife crime cases. Chief executive Douglas McAdam said the organisation "unreservedly" condemned wildlife crime. However, he said the measures being proposed, such as restricting licences on land where there is a good reason to believe crimes have taken place, would "demand a very robust evidence base" and could result in unfair restrictions on people's livelihoods. Mr Orr-Ewing claimed that while many Scottish sporting estates had "a good reputation for giving a home to our native bird of prey species, the recent and historic problem of the killing of protected raptors is largely associated with land managed for commercial driven grouse shooting". He said: "This sector appears unwilling in many cases to embrace the change in public expectations, as well as adopting modern, sustainable land management practices."